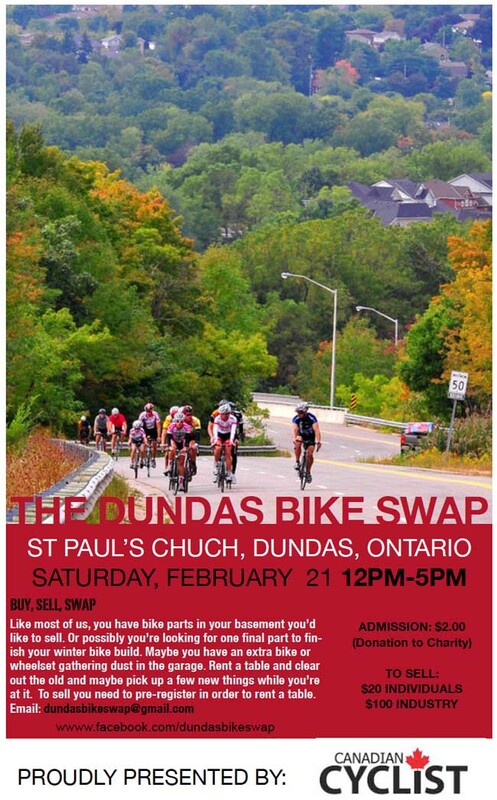 After a very successful introduction last year, the mid-winter Dundas Bike Swap returns for 2015. The event will be held at the St Paul's Church hall in Dundas, Ontario, on Saturday, February 21st, Noon - 5:00 pm. Individuals can rent a table for $20, and industry members (shops, reps, distributors, etc.) for $100. Entry for non-exhibitors requires a minimum $2.00 charitable contribution. Last year, the event was crammed with people, selling and swapping kit and equipment they no longer had a use for. Rent a table and clear out the old and maybe pick up a few new things while you're at it, or drop by and maybe get that wheelset for your beater bike, or some extra tires. To sell you need to pre-register in order to rent a table, by e-mailing dundasbikeswap@gmail.com. Visit for more information.